A terrible DS version of the hit PC MMORPG. When a game is a mega-hit on the PC, you know it's only a matter of time before an executive gets the notion that, "Hey, this could be a hit on a console as well." Seeing as how Ragnarok Online attracted millions of users, Xseed Games decided to make a Nintendo DS version, aptly named Ragnarok DS. Unfortunately, this version doesn't even come close to repeating the same success as its PC counterpart. 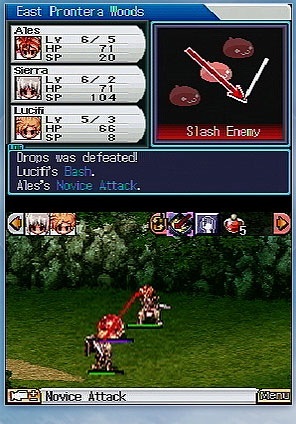 In the game's shrunken-down storyline (compared to Ragnarok Online), you control Ales, an orphaned young warrior who comes across a magician suffering from amnesia named Sierra. The two of you decide to work together, battling enemies in dungeons and looting their corpses. Along the way, you stumble upon a plot to save the world from an evil cult, dedicated to resurrecting a powerful goddess to destroy humanity. The story, unfortunately, is less than intriguing. Most of the characters aren't worth giving a damn about, there are very few twists and, worst of all, you can't skip conversations. You can fast-forward, but you'll have to tap, tap and tap again just to move on to the next section of the quest. Even the missions come up short. Most of the time, you perform the same old dungeon crawl, stumbling your way through pathways and caverns until you somehow come across the level map. There's no evolution in gameplay. You choose your attack, it unfolds, the enemy attacks and then you do it all over again. Only the job leveling system piqued our collective interest. Here, as you proceed on the tiresome journey, you can select from a number of occupations, including Taekwon Kid, Merchant and Acolyte, then upgrade them accordingly depending on your skill. It's a bright spot in an otherwise boring experience, and the only thing worth looking forward to (unless, of course, you dig dungeon crawling). Xseed added online functionality through Nintendo's Wi-Fi Connection, but it's limited at best. You work alongside fellow players in a huge skirmish across 50 levels of enemies. That's it. There's no co-op questing, no challenges, nothing, and that's if you can find players. The last two or three times we connected, there was barely a community to speak of. Seeing as how Ragnarok Online has a huge following, this is a huge downer. As for the presentation, it's horrible. The visuals suffer from blurriness, whether your character runs through an open environment or visits a heavily populated town. The locales vary, but the game looks unappealing, especially when compared to the superior Final Fantasy games. 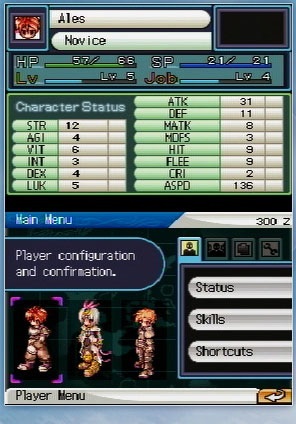 (Xseed should take notes on how Square Enix handles presentation in a DS RPG.) Finally, the music's not bad, but it repeats too often. Ragnarok DS is a huge disappointment, whether you're a casual RPG fan or a tried-and-true follower of the MMORPG series. The gameplay holds little to no interest, the presentation has serious flaws and the multiplayer is nothing more than gimmicky. If you must dwell in this world, your best bet is to do it on the PC. What's Hot: Job leveling system is better than expected, hours of dungeon crawling (if that's your thing). What's Not: Stale narrative, graphics are below other Ragnarok games, gameplay doesn't rise above the usual RPG fare, music repeats, multiplayer consists of simple enemy hacking (and no questing), you can't skip conversations.